A picture is worth a thousand words, have a look for yourself. So, how to get this goodness on your computer. Quite easy. Simply follow the following steps and you will have a similarly amazing desktop. Ubuntu users, head over to here. Everyone now head over to weather.com and register yourself. Obtain your XML Partner ID and License key. Use the following command to search for your location code. Change Zurich to your city name. You can then get the location code from the output of the above command. Next, copy the conkyForecast configuration file over to your home folder and fill in the Partner ID, Location Code and License Key. Download the conky configuration file from this link and save it to your home folder as .conkyrc. Now download Conky Colors from gnome-look. Extract the archive and install all the fonts that are present in the package. Even though not all of the fonts are required for the setup (you can take a quick look at the conky configuration file to see which fonts are actually needed) the fonts are quite nice and having them on your computer won’t hurt at all. Install conky if you have not already done so. IMP: This theme is tested with conky-1.8.0_rc2 so make sure you are using this or a newer release of conky. If you are on gnome please edit the configuration file to suit your needs (in particular change the location code to get the weather of the city you reside in) and then launch conky. If there are any particular hacks that are needed to integrate conky and gnome, my apologies for not being aware of them. Please feel free to add any such suggestions in the comments section, I will update the post with it. If you are using KDE4, also install feh, an image loader which will help us to integrate conky seamlessly into the KDE environment. Now create this script, which we will use to launch conky. The above script is supposed to read your wallpaper settings and use that to redraw the background of conky. For some reason, it is not working for me so I hard-coded my wallpaper in to the script. Use whatever method suits you. Do remember to make the script executable. Take a final look at conkyrc. Make sure that you have the right location ID for the weather. Use KDE system settings to add this script at startup and voila! We are done. We now have the perfect conky setup. For immediate testing, launch the script. I got the idea of the original config from a post at Arch Forums. I can’t find the original post right now. Will update as soon as I do. P.S. The music part will only work if you use MPD. What theme is that, and I assume it is KDE4, right? Post the details to your theme, my nig. As I said above, theme is bespin (widgets and icons) and plasma theme is Tibanna. If you are interested, I could write up another post with detailed instructions and configuration files to achieve the same look for your desktop. Could you please? I would be very thankful if you could write instructions to make our desktops the same as yours. Well… that’s amazing but honestly i have a hard time seeing it… wonder what others have to say..
“Conky: MPD error: problems getting a response from “localhost” on port 6600 : Connection refused” ?! MPD should be running – if you do not have MPD running or do not use MPD comment out the music section of the conkyrc file. The provided config uses MPD to get the current playing track info. Very nice wallpaper. Would you mind sharing it? impatient to look into more and more of your own posts, thankx! And want to ask you: is this blog your hobby? Thanks :). And yes, this blog is a hobby for me. I’ve used Mac for my system for years but the more they jail their new products the more disturbed I become. Have been following the Linux community for years as well as running Ubuntu in virtualisation for a hobby. I love the infinite possibilities with Linux, and just took possession of my new laptop today which will be converted permanently to Linux tomorrow morning… no partition! Beginning a permanent transition! I’m completely new to using Kubuntu, so I’m having extreme difficulty running this. Is there a simple source code for the setup you have on the right with the calendar, music, weather, etc? This means that you have not configured conky. Read the post again – you have to download the conky configuration file from the link that I have provided (the file is hosted on gnome-look). Follow the guide (as mentioned in the post) on how to configure conky and you should be good to go. Man, did you get it to work? I love your conky setup but also you theme and icons theme…can u telm what icons are u using and which theme??? Nice setup. I had one question. If you have a setup with a wallpaper switcher, which changes your desktop wallpaper every so often, then when it does change the wallpaper does the background behind the conky window also change instantaneously? The reason I am asking is that I use Desktop Drapes to change my wallpaper and when it does so conky takes some time before it realises that the wallpaper has changed and then it redraws its background to match the wallpaper. Do you know anyway if this can be done instantaneously? The only way I can see this being done is that you script the entire process. 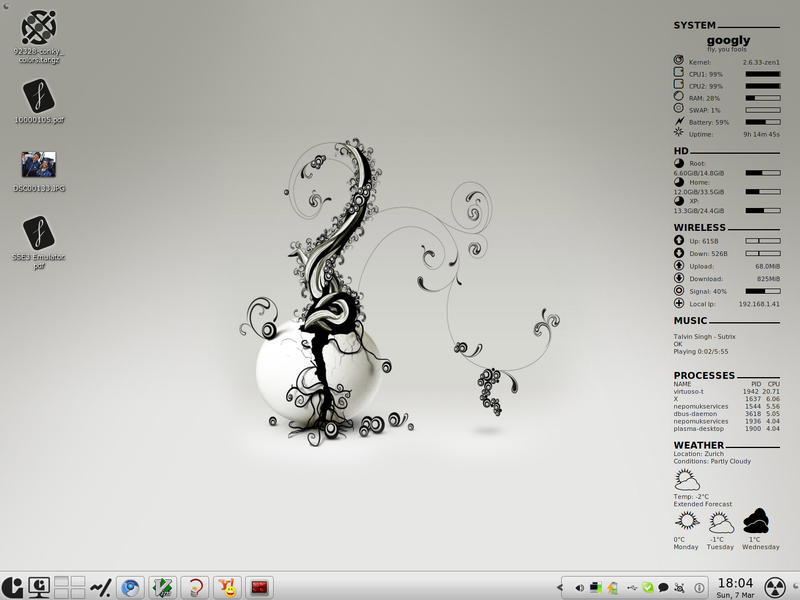 As soon as the wallpaper changes – reload conky. Other than that, I do not know of any other way to achieve what you want. Anybody know how to escape the “$” in conky (in case you want to print the $ sign)? Is it possible to run more than one conky config file using only one instance of conky? I have tried to search for the answer but I have not seen it done anywhere. All the places I have looked seem to require one conky instance for each conky config file. Am I missing something? I don’t think this is possible at all. 2) The mnt/XP don’t work, i got Windows 7 and have tried to get it to display that, but with no luck. 3) Can i get it to show HDD/CPU/GPU/System temperatures? 2) Is your Windows Partition automounted by your distribution. Maybe it is mounted at another directory – otherwise add a line like this to your fstab. 3) Look here: http://conky.sourceforge.net/variables.html . There are various ways to get the temperature. Take your “snapshots” f’ing adware and stick it up your *** To view a screenshot even I’m getting these irritating popups. Doesn’t matter how fantastic your post is, with this software running. Massive THUMBS DOWN for you in Stumbleupon….. Thanks for the instructions. I have run into a problem where sometimes opening a file on the desktop with “right-click->open with” will make conky disappear. I do not know if it makes a difference on not but I am using “folder view” activity for my desktop. How do I get ConkyForecast if I don’t have my own website or company? These are some of the required fields for the weather.com xml sign-up. Just fill in some random stuff in those fields. Instead of getting a pie chart I just get a number “7”. I’m on Ubuntu (Unity). Is there a font set I need to install to get right symbol? Also I changed the “own_window_type overide” to “own_window_type normal” so that the conky window wouldn’t always be ontop of regular apps and go to the background. Great setup and outline on how to get working! Only thing not working the the acpitemp command. Found a bug report for this and a reference to using: /sys/class/thermal/thermal_zone0/temp but haven’t figured out how to implement this. Howdy! I simply would like to give you a big thumbs up for the excellent information you’ve got here on this post. I’ll be returning to your site for more soon. I am trying to install conky with weather applet, but I don’t manage to get the Weather.com ID’s (XOAP_PARTNER_ID, XOAP_LICENCE_KEY). Is there something I should know? I got them from the url and it kind of works, but I would like to make conky widget a lot smaller. Does any of you know how to do that? Thanks! Useful information. Lucky me I discovered your website by accident, and I’m surprised why this coincidence did not came about in advance! I bookmarked it. An “image not found” is also worth a thousand words.